Karen Silver Bloom - "Home Baking Made Easy"
Kitchen curtain tie-backs and shade pulls, a child's rolling pin, egg beater, cookie cutter and tin plate border the nostalgia of this 50's kitchen, even down to the checkerboard floor. 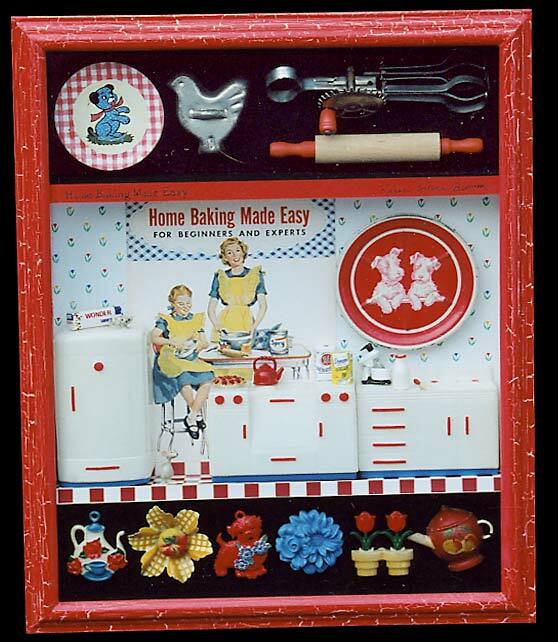 The old recipe book cover claims "Home Baking Made Easy." The frame is finished with a red and cream crackle, and the back of the box is covered with fabric from a vintage tea towel.